Saw this at CDW blogspot. Thought it was kewl. 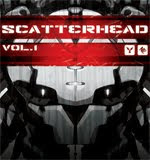 "Scatterhead Volume 01 is an online sketchbook created by the talented duo Adam Wesierski & Alan Blackwell. The compilation shows a number of rough and chaotic pieces as well as further developed and finished work. Both artist used the open source application Alchemy for laying down the initial sketches. Download the book for free here." garuda-a head gear for a theatrical performance..Pls feel free to comment! !